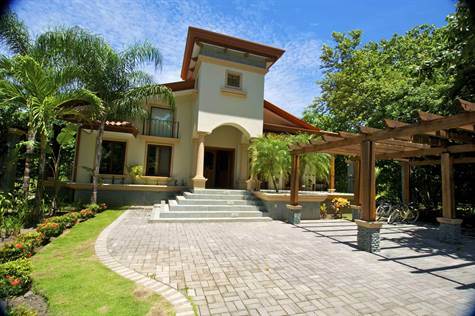 This beautiful architectural masterpiece of a home is for sale in immaculate condition, and is located less then 2 blocks from the beautiful golden sand beach and amazing surf in Playa Grande, Costa Rica! The home features Italian tile work throughout, and high end finishes, dramatic archways, vaulted ceilings with cane wood finishes, as well as beautifully made custom furniture. Each bedroom offers en suite bathrooms, large windows to let in lots of light, and black-out drapery for sleeping in, and custom designed closet spaces. All bathrooms feature showers, ample cabinet and drawer storage and large mirrors. The kitchen is bright and is delight to work in, with stainless steel appliances, glass cook top with oven/microwave, side-by-side refrigerator and wine/beer mini refrigerator. The large center island is a great place to prepare food on. The service breakfast bar and granite counter tops complete this gourmet kitchen. Great for entertaining! The stunning dining room overlooks the living room and the kitchen. It is furnished with a custom made hardwood farmer’s table (seating 8-10). The dining and living room boasts of floor- to-ceiling windows allowing the house much natural light. Also included in the sale are useful bikes, boogie boards, and beach chairs. Outside features an infinity pool, a spacious shady veranda, and gated parking.